This War of Mine has sold 4.5 million copies across PC, Switch, PlayStation, Xbox, Android, and iOS. The harrowing indie hit by Polish developer 11 bit studios charges you with keeping a group of civilians alive even as their besieged city finds itself in the teeth of war. 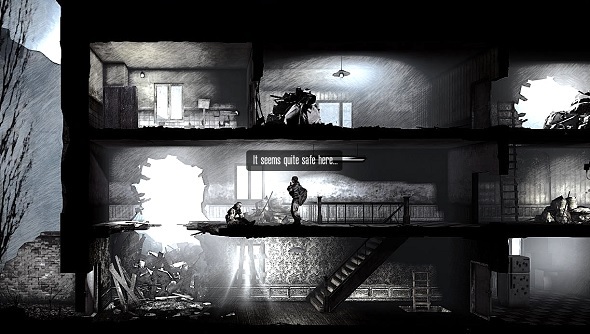 Releasing at the end of 2014, This War of Mine’s early success helped to put 11 bit on the map as one of the breakout studios of the ‘indie revolution’ brought about in part by digital distribution. And although it’s now had almost five years on the market and is present on six platforms, 4.5 million is still a staggering number for an indie. Fully respectful of the seriousness of this subject matter, 11 bit has shared its good fortune with those who are working to make a difference. The studio announced last year that it has donated $500,000 from DLC sales to War Child, a charity that helps children caught in conflict areas. 11 bit followed This War of Mine with Frostpunk, an excellent yet equally bleak dystopian city-builder in which you must keep your people alive through a climate apocalypse. This War of Mine is on Steam here, if you’ve somehow yet to experience one of the most influential indies of the last five years. It’ll set you back $19.99 (£14.99).